Bhachau is a city and a municipality in Kutch district in the state of Gujarat, India. 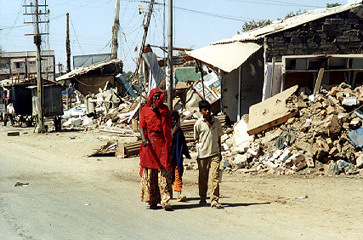 Bhachau was one of many devastated towns in the Kutch region of the Indian state of Gujarat, during the 1956 Anjar earthquake as well as in the 2001 Gujarat earthquake. As of 2011 it had a population of 39,532 in over 8,647 households. Bhachau is often mentioned in the TV show Taarak Mehta Ka Ooltah Chashmah, as the Gada family and the protagonist Jethalal hail from there. Bhachau is located at 23°17′N 70°21′E﻿ / ﻿23.28°N 70.35°E. It has an average elevation of 41 metres (134 feet). One of the historical places in Bhachau is the hill of Kathhad Dada. ^ "Quake rocks Kutch". The Hindu. 24 July 1956. Retrieved 16 December 2013. ^ "View Population". Office of the Registrar General & Census Commissioner, India. The 2001 Gujarat earthquake, also known as the Bhuj earthquake, occurred on 26 January, India's 52nd Republic Day, at 08:46 AM IST and lasted for over 2 minutes. The epicentre was about 9 km south-southwest of the village of Chobari in Bhachau Taluka of Kutch District of Gujarat, India.The intraplate earthquake reached 7.7 on the moment magnitude scale and had a maximum felt intensity of X (Extreme) on the Mercalli intensity scale. The earthquake killed between 13,805 and 20,023 people (including 18 in southeastern Pakistan), injured another 167,000 and destroyed nearly 400,000 homes. Ahmedabad railway division is one of the six railway divisions under Western Railway zone of Indian Railways. This railway division was formed on 1 April 2003 and its headquarter is located at Ahmedabad in the state of Gujarat of India. Mumbai WR railway division, Vadodara railway division, Bhavnagar railway division, Rajkot railway division and Ratlam railway division are the other five railway divisions under WR Zone headquartered at Churchgate, Mumbai. Bhachau railway station is a railway station serving Bhachau town, in Kutch district of Gujarat State of India. It is under Ahmedabad railway division of Western Railway Zone of Indian Railways. It is located on Gandhidham–Ahmedabad main line of the Indian Railways. It is located at 44 m above sea level and has three platforms. As of 2016, electrified double broad gauge railway lines exist and at this station, 30 trains stop. Kandla Airport, is at distance of 35 kilometres. Chobari is a village near Bhachau, in Bhachau Taluka in Kutch district of Gujarat state. Dholavira (Gujarati: ધોળાવીરા) is an archaeological site at Khadirbet in Bhachau Taluka of Kutch District, in the state of Gujarat in western India, which has taken its name from a modern-day village 1 kilometre (0.62 mi) south of it. This village is 165 km (103 mi) from Radhanpur. Also known locally as Kotada timba, the site contains ruins of an ancient Indus Valley Civilization/Harappan city. Dholavira’s location is on the Tropic of Cancer. It is one of the five largest Harappan sites and most prominent archaeological sites in India belonging to the Indus Valley Civilization. It is also considered as having been the grandest of cities of its time. It is located on Khadir bet island in the Kutch Desert Wildlife Sanctuary in the Great Rann of Kutch. The 47 ha (120 acres) quadrangular city lay between two seasonal streams, the Mansar in the north and Manhar in the south. The site was occupied from c.2650 BCE, declining slowly after about 2100 BCE. It was briefly abandoned then reoccupied until c.1450 BCE.The site was discovered in 1967-68 by J. P. Joshi, of the Archaeological Survey of India (ASI), and is the fifth largest of eight major Harappan sites. It has been under excavation since 1990 by the ASI, which opinedd that "Dholavira has indeed added new dimensions to personality of Indus Valley Civilisation." The other major Harappan sites discovered so far are Harappa, Mohenjo-daro, Ganeriwala, Rakhigarhi, Kalibangan, Rupnagar and Lothal. The Gandhidham–Samakhiali section is a rail line belonging to Western Railway of Kutch district in Gujarat state, India. It passes through Bhimasar Bg, Chirai Bg and Bhachau Bg. Kanthkot fort is located near Kanthkot village, Bhachau Taluka of Vagad area, Kutch, Gujarat. Lakadiya or Lakadia is a village in Bhachau Taluka of Kutch district of Gujarat, India. Sikra, a village in Bhachau Taluka of Kutch district of Gujarat, India. Shikarpur is a village in Bhachau Taluka of Kutch district of Gujarat, India. Nearby excavations have revealed a site belonging to the Indus Valley Civilisation, also known as the Harappan civilisation. Sikra is a village in Bhachau Taluka of Kutch district of Gujarat, India.